Aside from the numerous beauty stores, cafe/bakeshops can be found in almost every corner in the streets of Seoul, South Korea. 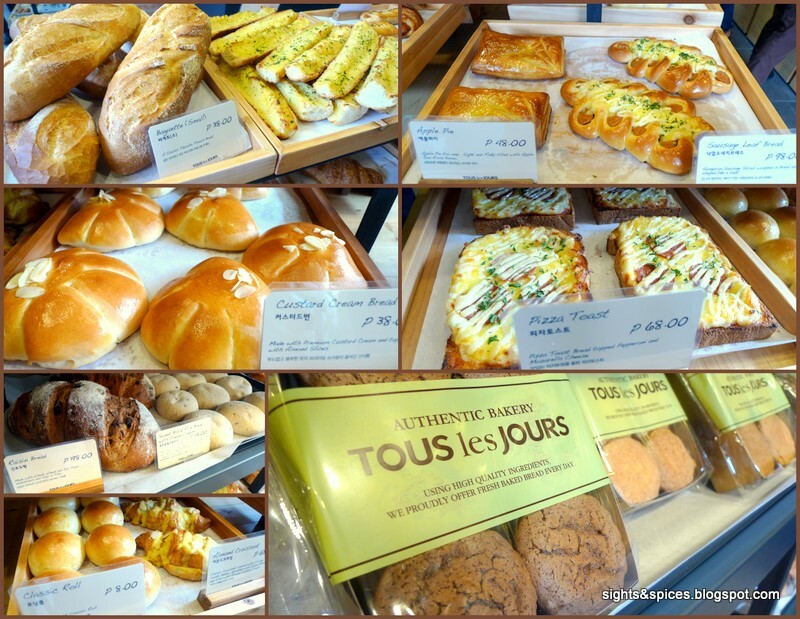 One of the more famous cafe/bakeshops that I wasn't able to try is Tous les Jours. Luckily for me, Tous les Jours has found its way here in the country. I was invited to try out the different tasty treats at their most recent branch that has just opened in Alabang Town Center. The store looks quiant and inviting, there was even a bicycle with a bread basket parked in front. Inside the red bricked wall exude a very rustic vibe. There was already a pretty long queue on the counter, majority of the people on the line were Koreans, this was a good indication that the breads are as authentic as it can be. The Sweet Black Rice Bread with Cream Cheese Filling is something familiar to me, I've tasted this half mochi-half bread creation from a chinese deli before. Tour les Jours version tasted way better, it was fluffier, softer and the cream cheese filling was sweet and savory. There were two croissants that I got to try, the almond croissant and the good old plain croissant. The Almond Croissant was topped with slivers of almond and cookie batter, inside was a creamy custard filling. Between the two Croissants, my favorite would be the Plain Croissant. A good croissant should have several thin flaky layers of pastry, Tous les Jours definitely bakes one of the flakiest Croissant that I've tasted. Best when heated for a few seconds in the oven. I'm not a big eater of Pumpkin or Squash. When I saw the Pumpkin Muffins, I wasn't even sure if I should put a piece of it in my mouth but I bravely did. I was so glad that I did, the muffin was delicately sweet and it was so moist. I think I found another way of eating pumpkin aside from soup, Tour les Jours Pumpkin Muffins is such a delight. My favorite pastry treat among the lot was the Apple Pie. Small chunks of apple in a gooey syrup with a hint of cinnamon inside a flaky buttery turnover. So good! I think I found my favorite savory turnover. The cafe/bakeshop industry has been booming in the country. Usually a store would have its own signature bread or pastry. In my opinion, what will set Tour les Jours apart are the gorgeous and unique looking cakes that they sell. Castella is a popular Japanese sponge cake, Tour les Jours offers two varieties, plain and chocolate. When the big block of chocolate sponge cake was brought out, I saw the eyes of the guests widen with delight. Though the chocolate flavor wasn't too intense, the sponge cake wasn't clawing sweet and it was wonderfully soft and moist. I am a big cheesecake person, I have tasted good and bad ones. As I was told, to make the New York Cheesecake taste like how it's intended to be, Korean bakers were sent to New York just to watch and learn to make the real thing. The New York Cheesecake gets high ranks from me. As soon as I took my first bite I knew that this was made of good stuff, no extenders used. It was so dense and creamy, the balance of the sweet and sour flavors was spot on. The crust is not made up of the usual graham crumble, grit bread was roughly spread around to make the crust. The Strawberry Inspiration Cake was literally beautiful in every sense. The attention and detail in making the cake is so admirable. Inside was a three tier sponge cake with slivers of strawberries at the bottom and light fluffy cream icing in between each layer. On top, it was dusted with ground up dehydrated strawberries and green tea powder. To be an authentic Korean bakeshop, the store even sells different Korean beverages. I'm no pro surfer nor am I an expert of doing it, I'm not even an amateur. I'm just a beginner who enjoys hitting and riding the waves whenever I get the chance to. The thrill of getting up on the surf board to ride a wave is truly addicting. Here are some of the top surfing places in Luzon that I got to surf at, all my views and opinions are based on what I experienced. Bagasbas is located in Camarines Norte, this was the first spot where I first tried surfing. The beach stretch long and wide, the waves came one after the other. During the time I was there , the waves were a good two to three feet high. Most of the accommodations in the area are inns, cheap and very basic. At night, there were a lot of people walking and hanging out around the shore holding bottles of beer. Upon the mention of La Union, the favorite spot of beginners would be in San Juan. The beach shore itself is pretty short compared to the other two spots. Among all the three beaches, I felt that this is the perfect place for beginners to try out surfing, waves were only one to one point five high when I was here. There are a variety of accommodation which can be found here, from simple affordable rooms to nice looking villas. At night, there are a lot of bars that plays hip tunes and offers different alcoholic beverages. This surf beach would be the perfect choice for people looking to have a great night life. "Let the good times roll...Cheers!" Among all three, Baler was the most challenging surf spot for me. The first time I tried surfing here, the rough waves were three to four feet high . Compared to the other two, Baler has the longest shore line. Just like L.U., Baler offers different choices for accommodations and as of the moment a hotel is being built. At night, most of the area gets really peaceful and quiet though you can still grab a beer or cocktails at nearby restaurants and resorts. All of the three surfing beaches has excellent fine sand and pristine waters. 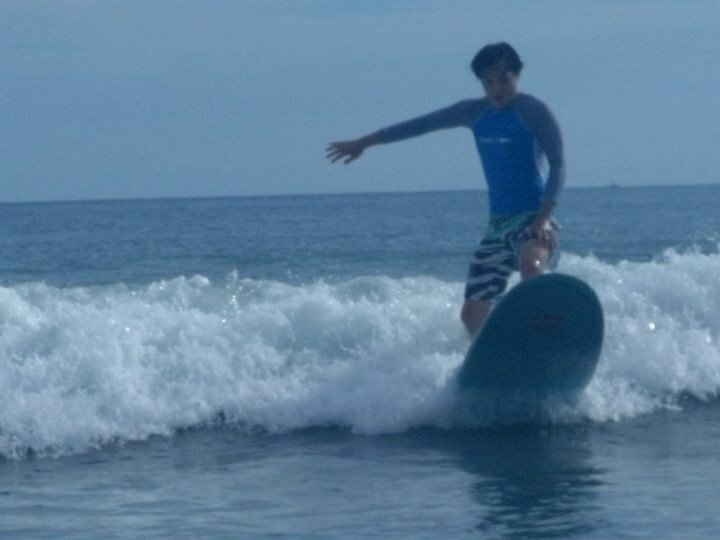 Rental of surf boards with instructors cost around Php400 per hour. The best time to surf for beginners starts from the month of March to November. To check out how high the waves are, visiting www.magicseaweed.com is very helpful. One has to remember that these are surfing beaches, if the waves gets really high swimming is not advisable. From the three surfing spots that I've been to, my favorite would be Baler, Aurora. I've already been here three times and I'm still planning to go back anytime soon. Though it is the hardest surf spot for me, I really liked how peaceful and quiet the town is plus the locals are friendly and very laid back. Surfing is just an awesome experience. The excitement of standing on the board while cruising forward as you feel the gush of the crashing waves from behind is incredible. It feels like being one with the waves but at the same time conquering it. So enough talk, grab you board shorts and put on your rash guard cause its Surf's Up!!! Being a relatively new Chinese restaurant, I haven't heard anything about Phoenix Court. The one and only one thing I found out was this resto was nominated as one the best restaurants in the recent Miele Guide. The restaurant was set up like a typical banquet hall but in here, it was huge and spacious. Tables and chairs were far apart for guests not to hit each other when one has to get up from his seat, something that commonly happens in crowded Chinese banquet halls. I like the design of the lights at the bar. 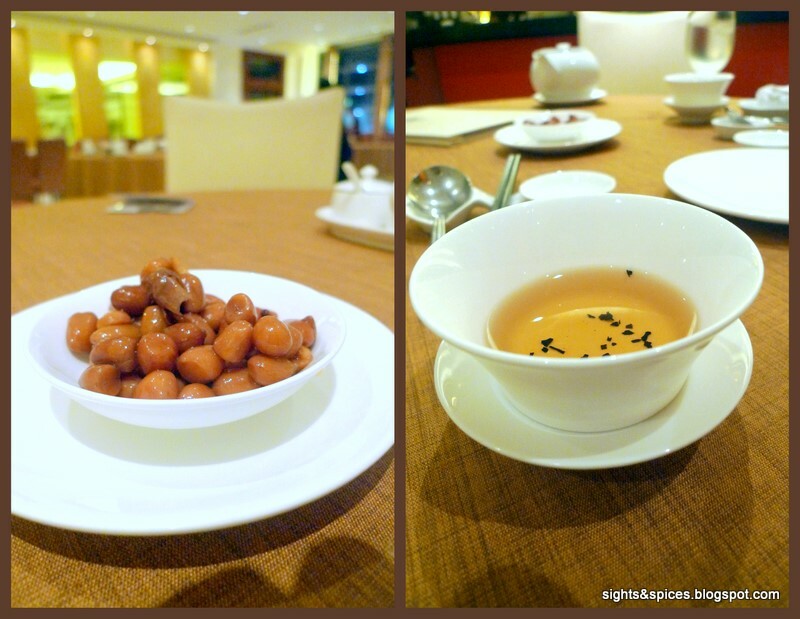 As soon as I got to my seat, tea was poured in my cup and a complimentary small plate of boiled salted peanuts was served. I asked the server for his reccomendations and I obliged to order the restaurant's bestsellers. I started with the Special Assorted Cold Cuts Combination. Slices of Pork Asado, Hainanese Chicken, Roast Duck, Chinese Ham, Seaweed Jelly and Century Egg makes the platter. The dish was beautifully presented, the platter was shaped like a phoenix. The Cold Cuts platter was served with a neatly presented sauce plate. The sauce plate consisted of a Hoisin, Light Vinegar and a Chopped Ginger with Oil sauce. Generally everything tasted nice and savory. The Pork Asado though was kind of tough, I felt that it wasn't thawed well enough before being served. I particularly like the Hainanese Chicken, it was so tender and flavorful. Bite-size pieces of beef on top of a bed of sliced onions with green, red and yellow peppers makes up the Quick Fried Beef Tenderloin with Black Pepper dish. This dish get high marks, it was seasoned well and the beef was so tender. It wasn't too salty or spiced up, it tasted just right. I like how tender the beef was, it had sort of a gelatinous chewy texture. I also loved how the onions and pepper were lightly stir fried, I enjoyed munching on the crunchy vegetables after grabbing a piece of beef. One of my favorite dishes in a Chinese banquet feast is the Steamed Whole White Fish with Light Soy Sauce.The Steamed Dory Fish Fillet with Soya Sauce in Phoenix Court hits the spot. The fish fillet was cooked perfectly right through, the fillet melts in your mouth. The sauce tasted exactly like how it is supposed to be, light, savory with a little astringent flavor coming from the onion leeks and wansoy. If there is one dish that Phoenix Court can boast of, it is the Homemade Bean Curd with Crab Meat and Fish Roe. In my opinion, this will be the dish that will put Phoenix Court on a foodie's map. It is SO good, it automatically became one of my favorite tofu dishes. As I was told, the bean curd was mixed with eggs, it made the tofu yellowish and it sort of formed an outer crust on the tofu block. The sauce was thick and savory, it had huge chunks of crab meat and eggs. At the bottom was slices of Bokchoy which added the crunchy chewy texture to the dish. Usually fish roe is used for garnish but in this case it was actually part of the dish. As soon as I swallowed the soft silky tofu and the chunks of crab meat and eggs, I could feel the roe popping in my mouth. I haven't tasted anything like this and I would go back just to partake on this wonderful dish alone. When eating Chinese food, I would usually feel satiated from all the flavors and oil that came from the dishes. Phoenix Court's Buco Pudding was the perfect ending to my meal. It tasted light, fresh and refreshing, the perfect palate cleansing dessert. Simple and Delicious! After my meal, Chef Cheong Kwan Loong, a Malay-Chinese who heads the kitchen came out to ask me how I liked the food. I told him that Phoenix Court is definitely a Chinese Restaurant who makes and cooks great Chinese food. I also added that his creation of the Bean Curd dish and Buco Pudding dessert was unique and truly amazing. He gave me a smile and told me he was glad that I liked his food, I shook his hand and I told him it wasn't the last time he'll be seeing me.